Su una collina, con vista sull'Oceano Pacifico e circondato da palme vergini, Casa Colina è una casa unica in un ambiente privato con vista mozzafiato sull'oceano e sulla giungla. Se sei un amante della natura, si prenderà in considerazione questa casa unica per essere il vostro pezzo di paradiso. Fornisce palapa all'aperto, dove è possibile rilassarsi e prendere il sole sulla grande terrazza avvolgente mentre si osservano le megattere migranti, le scuole di Mantas che salta, i pellicani che si tuffano, i greggi colorati, i picchi dai capelli rossi, i falchi in volo e numerosi altri uccelli tropicali. Oltre all'osservazione della fauna selvatica, senza nemmeno lasciare la terrazza, è possibile vedere la pesca colorata e le barche a vela di lusso che cavalcano le onde della baia. Questa casa è l'ambiente ideale per una coppia in cerca di una posizione molto riservata, così come il posto per 2 coppie che scelgono di passare le vacanze insieme, poiché la casa dispone di due suite separate con letti queen size e bagni privati, entrambi con un unico tropico aperto docce, migliorando la tua esperienza in questo splendido scenario, permettendoti di immergerti nella massima privacy mentre ti senti parte dell'ambiente tropicale circostante. Inoltre, la casa dispone di 2 patii esterni separati. Sul patio laterale, è possibile posizionare la poltrona per sfruttare la vista della giungla e dell'oceano. Nel patio frontale, potrete godervi i suoni ritmici dell'oceano, mentre osservate il surf break sulla riva e le rocce sottostanti. Se si ha una vacanza più attiva in mente, la spiaggia di sabbia bianca, situata proprio sotto casa, offre nuoto, snorkeling, pesca, kayak di mare e surf. Se sei un giocatore di golf, puoi accedere al Los Muertas Golf Club facendo una passeggiata di 10 minuti verso il villaggio. Numerose escursioni sono offerte anche dalle compagnie turistiche situate nel pueblo di San Pancho, a cui si può accedere camminando per 10-15 minuti nel villaggio. Se il tennis è il tuo sport, puoi giocare su un campo in terra battuta privato, disponibile, solo su prenotazione, facendo una breve passeggiata nella giungla. Nel vivace e spesso vivace villaggio peschereccio messicano di San Pancho, puoi provare il tuo spagnolo e visitare i numerosi ristoranti che servono deliziosi piatti locali e pesce fresco. Una grande attività Sabato sera è a piedi al campo di polo nel villaggio di San Pancho per guardare una partita di polo. C'è anche un ristorante vicino al campo di polo dove puoi cenare e bere mentre guardi la partita dal tuo tavolo. Parole chiave: Spettacolari viste panoramiche A 15 minuti a piedi nel villaggio di San Pancho. Accesso alla spiaggia direttamente di fronte alla proprietà. Sicuramente IL POSTO per l'osservazione di uccelli e balene tropicali. Per favore fateci sapere tutte le domande che potreste avere. Entrambi i bagni sono tropicali docce all'aperto. Ci si sente come se si sta la doccia all'aperto, ma hanno la privacy di una doccia interna. Ciò fornisce un'esperienza di bagno molto speciale, specialmente di notte quando c'è un cielo pieno di stelle. La cucina è attrezzata con forno a microonde, fornelli, frigorifero full size, pentole e utensili, Tutto il necessario per il vostro piacere. È possibile ridurre il confezionamento di capi di abbigliamento, come la cameriera farà il bucato per voi, Tutte le lenzuola, tra cui teli mare sono forniti, e non vi è il servizio di pulizia completo due volte a settimana, No Animali o fumatori favore. La casa è disabili con alcune eccezioni. Loved the open home in the trees... amazing views!!! Beautifully designed house with lots of outdoor space (and shade to escape the sun when it gets too much.) The two bedrooms/ bathrooms are very separate so would work really well for two couples. I would recommend getting a golf cart because it is up pretty high on the hill and about a 30 - 35 minute walk from town -- doable walking but better with golf cart. Very quiet and private, a real escape. There is no pool but there is easy access to an outdoor shower. The owner tries very hard to make you comfortable and happy. Really loved this trip. Our best Mexican vacation yet! We will soon return. When we walked into Casa Colina, our first impression was, WOW, what an amazing view! Due to the openness of the front half of the house, we were able to enjoy an unobstructed 180-degree view! We found it difficult to tear ourselves away from the lounges on the front patio and walk the short distance into the village of San Pancho, but when we did, we discovered an adventure awaiting us as we explored the numerous and varied shops, interacted with both the locals and visitors, and savored the food in the numerous and diverse restaurants. Cudos to the owners who created this unique home, in a pristine environment, that also has one of the best views on the Riviera Nayarit Coast. We absolutely loved Casa Colina! My wife and three children had a great time. Paula was great - v. responsive and 'on it'. Bob, thanks for your review and for taking such good care of Casa Colina. We hope we will think of us and San Pancho when planning any future trips to Mexico. The actual physial description of the property was accurate.It's a pretty place with great views. However, our experience that week was different from what was contracted.The house had clearly not been prepared for renters. No one had used the house for several months and it showed. Examples: Sinks in the bathrooms were dirty, a partily filled old botttle of wine was in the living room, musty smell in the bedroom, owners' property stuffed behind the bed, no clear surfaces in the guest bedroom for renter use, some light bulbs out with no replacements around, towel rack broken.The description included internet service, phone service, filtered water, and a housekeeper for 2 days. None of that happened (except internet on the last evening of our stay}. Having no phone service was especially stressful as the house is up a steep hill and somewhat isolated (the closest house was empty and up for sale). Cell reception was, at best, spotty. It was difficult, frustrating, and expensive to communicate with the owners who live in the US. They were slow to respond and, in general, did not treat us well. The tone was set when we first got there.The key to the house was not where it was shown in the photo they sent us. We called. Their first reaction was to argue that they had sent a photo of where the key was rather than to believe it was not where it was supposed to be. In fairness, they did attempt to remedy some of these complaints from afar, did eventually listen to our upset , and did refund us a small portion of the rental charge. We hope the owners will take this review to heart and be more prepared for the next renters. Our guest is correct, the key was in the wrong place and after she told me, I called our manager, who apologized, and told me where to find it. When I called her back with the info., she said the phone wasn’t working. I called the phone company, they said they were working on it, and I let her know. She told me it was costly for her to use her cell so I told her I would call her in order to keep in touch and make sure things were going OK. However, I soon found that I could only leave messages on her cell, to which she didn’t reply, so I began e-mailing, also to no avail. I still don’t understand why she didn’t communicate with me, regarding the problems she describes in her review, as there were numerous occupied homes nearby and anyone of them would have let her use their phone and/or internet. In addition, it is only a short walk into the village, where she could have used one of the internet cafes. Casa Colina is in a private setting but definitely not isolated. Since she had only informed me of the 2 problems, described above, there was no way I could have rectified the others she mentions in her review. She says I argued with her about the location of the key. I don’t understand why she perceived our conversation that way. It would be foolish for me to take that tact with someone who was going to be staying in my house for a week. As a result of the problems this guest encountered, we have now hired a new manager. His office is on the main street in San Pancho and he is open 24/7 so he can assist our guests with any problems they may encounter, and we now have a lock box at Casa Colina in order to prevent any future problems with the location of the key. After our guest returned to the U.S., I called to ask how her vacation had gone. She expressed disappointment, due to the lack of phone service and the condition of the house. I was quite dismayed when I heard her statements, regarding the condition of the house, since we have never had anything but glowing comments from past guests. I asked what she felt would be fair compensation. She said $500. so I sent her a check for that amount, yet In her review, she expressed dissatisfaction with the amount of the refund, even though it was the amount she had requested. 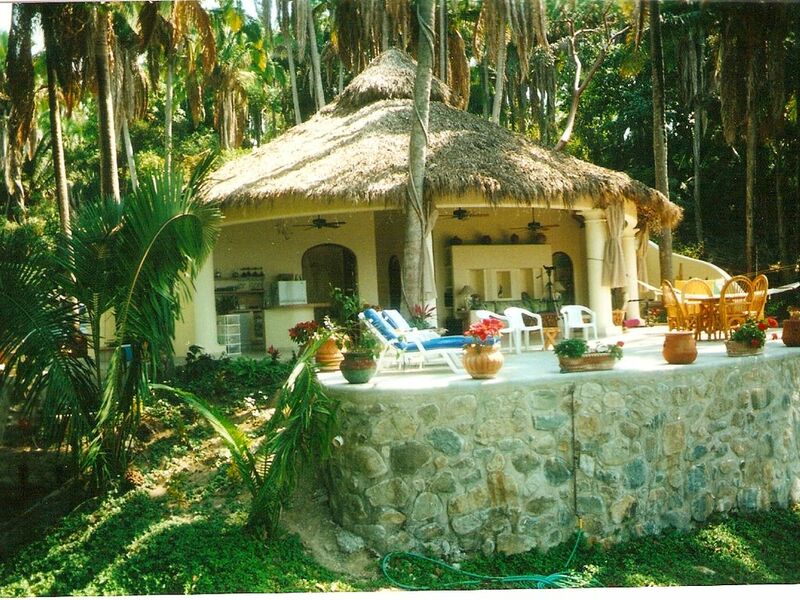 Beautiful, quiet, and all the comforts of home - we couldn't have asked for more than Casa Colina! My friend and I rented this beautiful home as a 'girls getaway' for a week of relaxing and old friends reconnecting. We couldn't have DREAMED of a better place! The view was outstanding and the home was just lovely. The beach is just a nice walk down the hill; a short walk down the beach and you're in town and being served margaritas on the beach!!! The two master suites were perfect and provided us privacy when we wanted it, and the open-air showers were wonderful! The nicely-equipped kitchen provided us with everything we needed to cook at home, or re-heat anything we brought back as leftovers. I would definitely recommend Casa Colina to friends and relatives - we are already planning on going back next year! Kayak di mare, surf, lezioni di surf, equitazione, yoga, massaggi, manicure, pedicure, o semplicemente per rilassarsi in un ambiente privato molto tranquillo. Il centro di attività di San Pancho ora offre lezioni di spagnolo, visite guidate ad una fattoria di orchidee e la casa calda, oltre ad altre attività della comunità. Basta essere sicuri di controllare di frequente il loro programma fermando dal centro.